Cockroaches can cause serious problems in your business. They are unsightly and are perceived by your customers as a sign of unsanitary conditions. 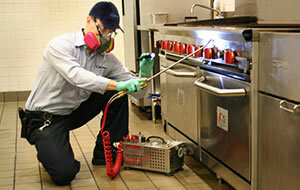 Health Inspectors will not hesitate to close your business if they believe your infestation is serious enough. Your service specialist begins with a thorough inspection of your facility to identify possible cockroach breeding sites and develops a cockroach elimination plan. Upon inspection, we begin treatment by injecting a flushing agent, utilizing the exclusive commercial “ACTISOL” machine. This machine is uniquely designed to flush out deep cockroach breeding areas in all cracks and crevices where traditional applications are ineffective. We then apply a residual dust for long lasting protection. “State of the art” cockroach baits are also applied as an alternative to traditional applications. Commercial and residential cockroach elimination, extermination service. Serving Sacramento, SF Bay area, the greater Los Angeles area, and all of California.